Start Yekaterinburg (The Academy of Geology Hotel) N56º51.492' E060º36.357' 287 meters . 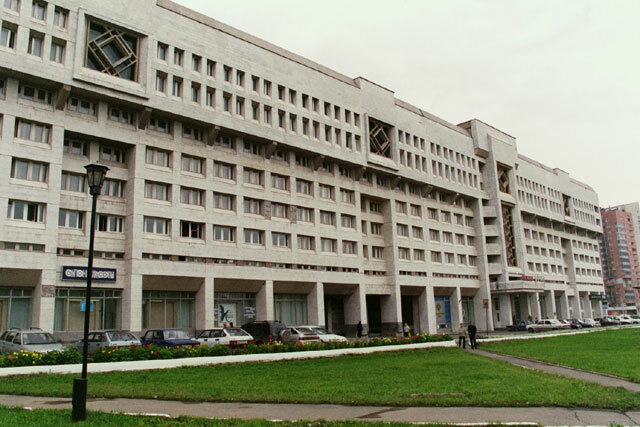 Tour city . . . .
Yekaterinburg (The Academy of Geology Hotel) N56º51.492' E060º36.357' 287 meters . 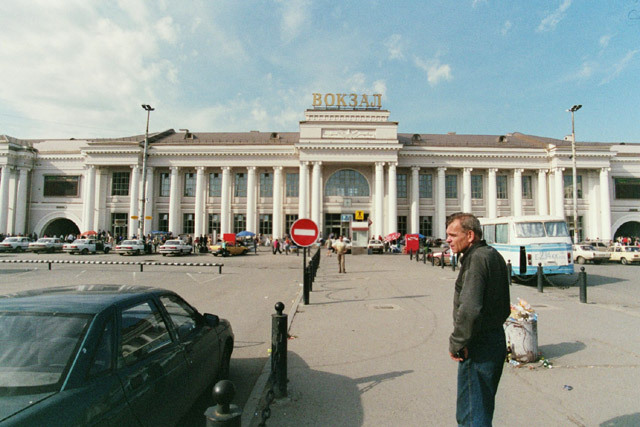 Yekaterinburg train station N56º51.492' E060º36.357' 287 meters . Perm 2 train station . . . . Weather: In the morning partly cloudy, occasional sun and warm. In the afternoon, mostly clear, sunny and hot. This morning we have a bit of a struggle to get out of bed - the heavy Georgian red wine has taken it's toll (or revenge) on us. Or maybe we are just starting to get old. But we are up at 10 AM, get ready, have breakfast and are on our way shortly after 11 AM. 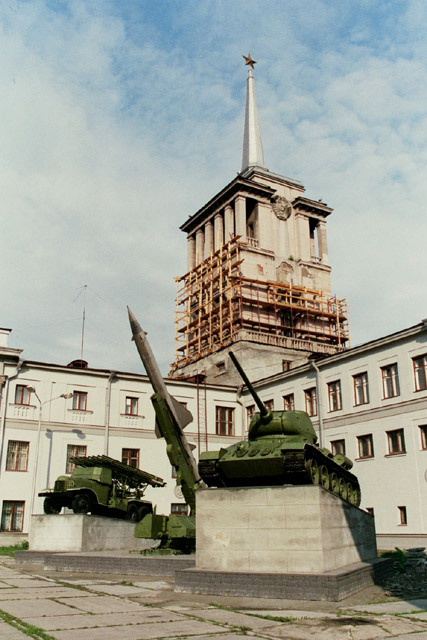 Our first objective is to try our luck at the Military Museum and see if it is open. When we get there, the doors are open and we head in, but we soon realise that it seems to be open for a special function. A stamp show or exhibit seems to be taking place. The male caretaker does not really want to talk with us and tells us the place is closed. But we soon come across a lady that is more sympathetic. We tell her that we cannot return tomorrow as we are leaving this afternoon. We also explain that we would really like to look at the Gary Powers display. After some further gentle persuasion, she relents and offer to show us the exhibit. As the exhibit is on the top floor, on our way up, we get to have a quick glance at the other floors. For a military buff, it looks like it could be very interesting. Well, the Gary Powers display is not too impressive, but it is interesting seeing these relics of one of the biggest crisis of the cold war. We thank the lady and slowly make our way down to the lobby, stopping to look at some of the stamp exhibits on the way out. We spend the next few hours wandering the streets looking at the buildings. We make a brief stop in the photo museum. Small, but with some interesting old and new photo displays. Then a quick stop at the internet cafe then some lunch at one of the fast food places. Before returning to the hotel, we stop at one of the provision shops to stock up on some food for the train. As usual, we have to struggle through the cashier system. As we are buying lots of small things, it makes it difficult. But we just write down the prices of everything we want, take it to the cashier and pay her the total amount. We take the issued receipt to the counter and point out the items we want. Once back at the hotel, we pack up our bags, have a shower and work on our journals before having the hotel call for a taxi to take us to the train station. We leave for the train station shortly after 5 PM and the journey there is much easier than on our way to the hotel. The taxi is another old, Russian car that has certainly seen better days. Once at the train station we gather up our bags and then sort our where our train will be leaving from. We discover that it is from the first platform and the rain is already there, but not quite ready for boarding. So we just hang out and get some snacks to eat while we wait. 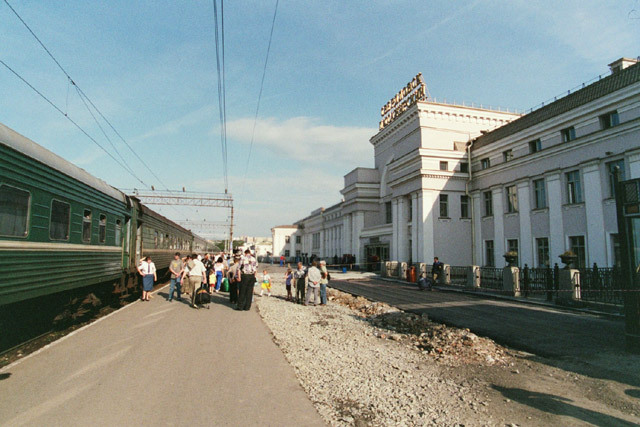 At 6 PM we are able to board the train, so we carry our bags up to the platform and hand over our tickets and passports to the provodnitsa. 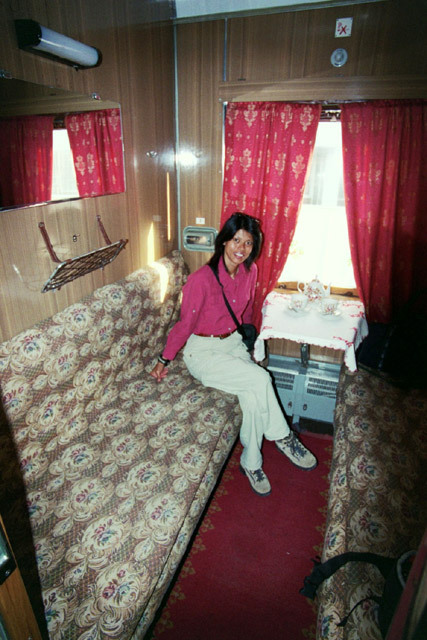 She is friendly and polite and we are soon aboard the train and settling into our compartment. Train #071 departs the station at 1824, just about on time. The train is made up of older cars, but it is nicely done. We have good, clean seat covers. Nice china on the table. And quite tasteful curtains cover the window. This train is also quite a fast one and we make good progress. Soon, we cross the Asian-European Border - 1912/1712 - KM 1,777/7,512, which is marked with a large white obelisk. We are now in Europe, but it certainly does not feel any different. Shortly after we cross the border, an attendant from the dining car comes by. She speaks no English, so we are not quite sure what she wants. She is showing us a menu, but we are not sure if she just wants to see if we want food or if it is included in the ticket. After some back-and-forth, she gets up and leaves. But she is soon back, with another passenger who speaks a little English. We are told that the meal is included in the ticket and that we have to select from the list what we want. 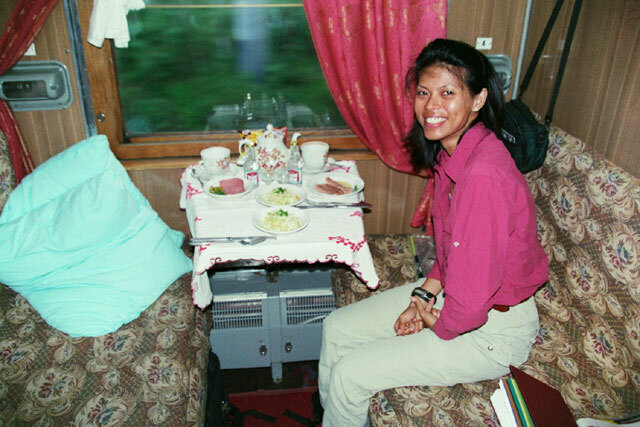 The meal is served in our compartment at around 8:30 PM and it consists of three courses, some mineral water and a small bottle of vodka. It is actually very good and we are certainly impressed with this train. The only sad part is that we will spend very little time on the train. We make one stop during our ride at Shalya - 2109/1909 - KM 1,672/7,617, a small station with a pleasant brown and red station building. As we carry on from here, we pass through thick forests that are covered with fog. It is quite an eerie scene in the fading daylight. For the rest of the train ride, we just hang out, relax and do some reading before we arrive at Perm 2 - 0040/2240 - KM 1,436/7,853, shortly before 1 AM. We are one of the few passengers getting off here and as we carry our bags onto the platform we are met by the guide and translator that we have arranged our stay here with. It is dark and cold and we have a long walk down the platform to the car park, where we load our stuff into their car. It is a short drive to the hotel, where they help check us into our room. Then, as we have an early start, we quickly arrange our stuff and get ready for bed.